Two weeks ago Team Beachbody came to Lansing, Michigan to have a Beachbody Coach game plan event. 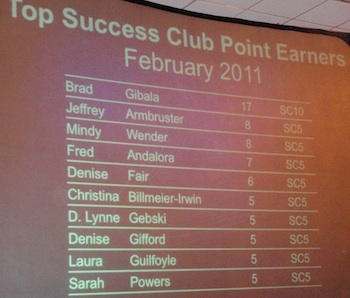 These events are a combination of Success Stories with workouts like P90X, Shakeology, and business success. About 200 people showed up with 90% of them already being a coach. It was the first time the corporate people from Beachbody came to Michigan. This was not my first game plan event but I know how important they are for new coaches to go to or for people who are using Beachbody products and are curious about what its all about. 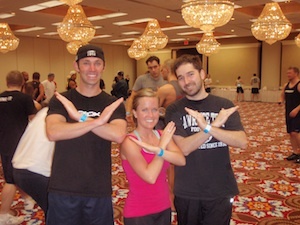 I heard one of my new favorite P90X success stories at the event. I forget his name but his story was about how he was told by his Drs that his life was pretty much over from a spinal injury and was given a life supply of Vicodin. The Drs told him to not lift over 20lbs of weight as it might mess with the surgery he had just had. At the time he had a baby girl who was almost over 20lbs. Drs. were basically telling him he could not hold his girl. He decided that since he was going to be in pain already that he might as well put himself through more and work on his body. He had seen the P90X infomercials before but realized it was too much and went with the Power 90 workout. During those 90 days with Power 90 he dropped 40 pounds and no longer had to take the pills. It was a pretty moving story to say the least. It still amazes me how these programs can change people’s lives. Kind of like my cousin-in-law Kevin (pictured with Andrea and I) who has lost 25 pounds in the past 3 months since starting Power 90. Craig Holiday gave a 30 minute motivational speech about why its so important to actively build our business. It really set in when he said “Its not about you.” Its so true. Our “job” as a Beachbody Coach is to tell people who are out of shape or have poor health that we have a remedy to it and will be there to support them. The business just follows. Every time I hear Craig speak I want to build a building or something like that. Its why I keep on pushing with the business. I know that I am truly helping people because I am able to tell people what I do to take care of my health. That’s probably why I had a really good month in February. I was focused on helping people. It was not all P90X and business success stories. This is a health and fitness business so of course we had an hour long workout. The first half was the Power 90 Upper Middle Lower workout led by fellow Coaches Tommy Mygrant, Jeff Armbruster, Jason Diebold, and Rob Boyes. The second half was an action packed 30 minutes of Turbo Fire moves.. I did much better with the UML workout and looked like an idiot doing Turbo Fire. I did pick up some new dance moves though. Every time I leave an event like this it reassures me that I am doing something that is really changing people’s lives including my own. Hearing other people’s stories are so moving. Jeff Armbruster did an awesome job of setting up the event and probably had the best quote of the day when he said “I would do this even if there was no business attached with it.” Well said Jeff. This is a great write up of The Game Plan Event Brad. Anyone that gets a chance to hear Craig Holiday speak won’t soon forget it. He really drives home the point of being a coach. Anyone can be a salesman and sell products, but being a coach is so much more. We aren’t hawking toilet paper like Amway. (No offense to Amway, we all need TP) There are more than enough success stories to prove these products can change lives. At the end of your life you won’t revel in your own accomplishments, but the accomplishments of those you helped empower. And thanks for coming Kevin. I hope you enjoyed your time and had a chance to see what being a Beachbody Coach is all about. Thanks for posting this, Brad….exciting and inspiring. Keep working on those dance moves!